Firefighter Justin Tichy, who grew up in the O’Fallon area, never wanted to be stuck inside behind a desk. Tichy says he also loves the camaraderie that comes with being a firefighter. 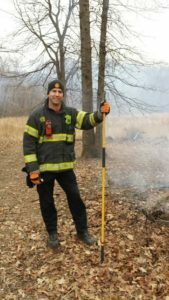 Tichy became a firefighter in 2012, and earned his paramedic certification in 2014. He has worked in Cape Girardeau, St. Charles County and Warren County. Tichy has additional training as a rescue boat operator, water rescue swimmer and confined-space rescuer. Outside of work, Tichy enjoys spending time with his wife, Melissa, and their two young sons. He is an avid skier — he even spent a winter working as a lift operator in Breckenridge — and also enjoys golfing, hiking and tinkering with things in his garage.